There is a ton of good things going on here today. A TON! Let’s start with the most obvious one. This recipe for Wisconsin Macaroni and Cheese. There just couldn’t be a better way to wrap up all that is Wisconsin in a bowl of mac and cheese. It’s filled with Wisconsin Colby and Fontina cheeses and Wisconsin smoked brats, and topped with a crispy buttery bread crumb crust. 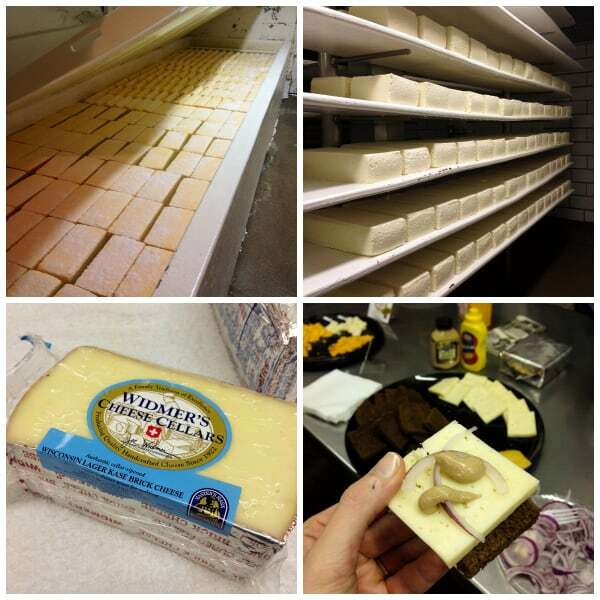 Plus there are some other goodies that make it very special to Wisconsin’s cheese heritage. I’ll explain it all in just a bit. Just stick with me here…you’ll even be able to win a whole bunch of Wisconsin cheese…be sure to read to the end of this post for information on the giveaway! And then we have MAC & CHEESE MANIA, folks! This event is being hosted by Rachel Cooks and Nutmeg Nanny. 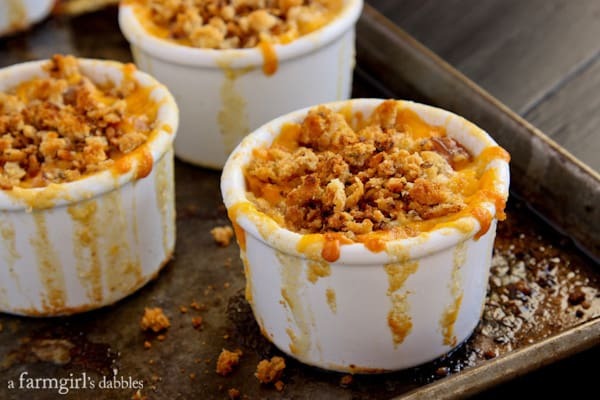 If you love macaroni and cheese, and are always looking for new ways to eat it, you’ll surely want to check out Rachel’s and Brandy’s blogs right now. Find mac and cheese inspiration, and link up your best mac and cheese recipes for a chance to win some really awesome prizes (think massive amounts of cheese and pasta and all kinds of fabulous kitchen equipment…over $1800 in prizes!!). You don’t have to be a blogger to enter. C’mon, everyone has a go-to mac and cheese recipe, don’t they?! Mac & Cheese Mania is being sponsored by Door to Door Organics and OXO. Keep up with all the Mac & Cheese Mania fun on social media by following #maccheesemania! 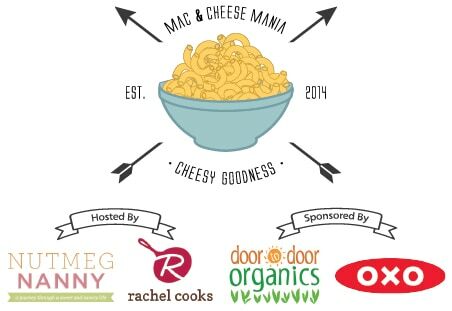 Come join Mac and Cheese Mania at Rachel Cooks andNutmeg Nanny sponsored by Door to Door Organics and OXO – Win prizes! 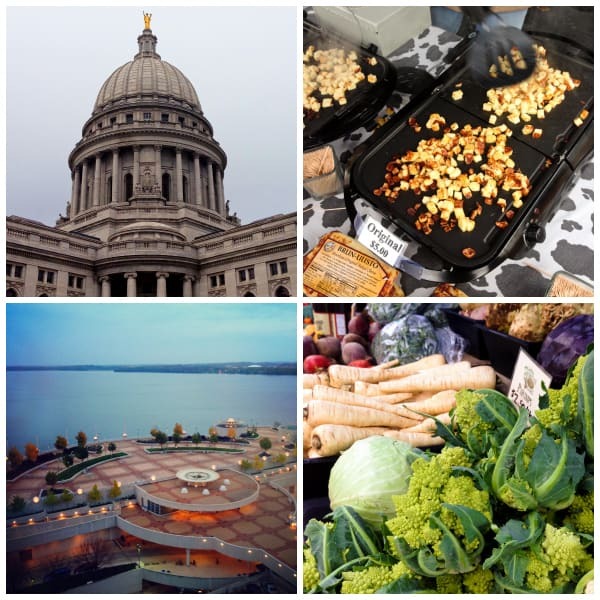 I’m also sharing about my trip to Madison, Wisconsin last fall, to attend the annual Wisconsin Cheese Originals Festival. As a guest of the Wisconsin Milk Marketing Board, aka Wisconsin Cheese, I was able to experience what I know to be a very small portion of all that makes up the Wisconsin Cheese empire. Having lived in the Midwest all my life, I’ve traveled the lengths of Wisconsin many times, mostly north to south, but also east to west. However, I never realized the magnitude of Wisconsin’s cheese making until I attended this festival. I was blown away. My use of the word “empire” is not exaggerated. 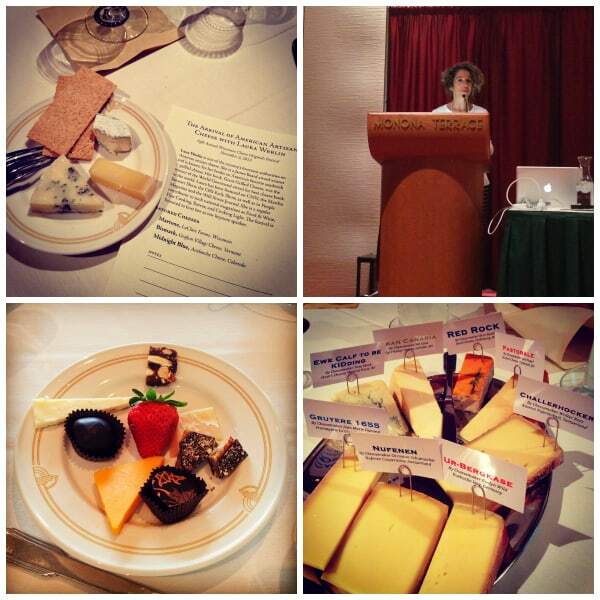 The Wisconsin Cheese Originals Festival was founded by Jeanne Carpenter, known as @CheeseGeek on twitter. Raised on Velveeta on a family farm in Wisconsin, Jeanne has been a passionate voice for the incredible range of cheeses and their heritages from her beloved home state. And the festival is a massive event, packing in all kinds of fun and education and cheese eating over the course of two days. It’s attended by cheese lovers near and far. I met people who traveled hundreds, even thousands, of miles to attend this event…and some make the trek every single year. Yes, it’s that wonderful! The festival grants cheese enthusiasts a backstage pass for special all-day tours to visit a variety of Wisconsin cheese makers at their farms. A gala event lets you sample more cheese than you’ve ever seen in one room at one time (my favorite pick goes to an aged Merieke Gouda by Holland’s Family Cheese), and educational sessions help you dig deeper into the history of cheese. I attended a session where attendees compared and contrasted European traditional cheeses vs. Wisconsin original cheeses, led by Jeanne and Jonathan Richardson of Columbia Cheese. I enjoyed every single bite of cheese set before me, loving the history lesson behind each particular cheese and its maker. It did not take me long to learn that there is ALOT to learn about cheese! The festival also offered sessions on pairing American artisanal cheeses with craft beer (led by James Beard award-winning author Janet Fletcher) and fine brandy (led by Justin Gibson of Vom Fass and Barrie Lynn of The Cheese Impresario). And lunch included a cheese and chocolate pairing (lower lefthand photo)…oh my, was that ever fun and delicious! Another speaker at the event was Laura Werlin, @CheezeLady (upper righthand photo), who talked about the state of American artisan cheese. I had the extreme pleasure to dine with Laura, Janet, Barrie, and a number of other wonderful Wisconsin Cheese folks the evening before Laura spoke, and was instantly drawn to her magnetic smile and sincere approachability. 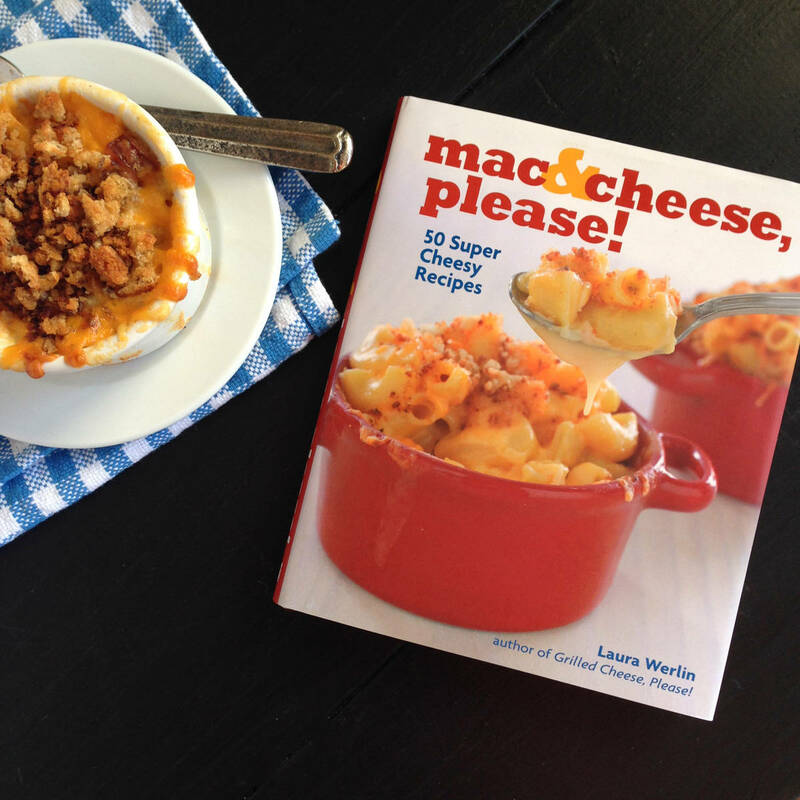 Laura has written several cheese themed cookbooks, to include mac & cheese, please!, where my rendition of Wisconsin Macaroni and Cheese comes from. An expert in cheese and wine pairing, and in particular American artisan cheese, Laura received a James Beard award for her book The All American Cheese and Wine Book. Her book, Laura Werlin’s Cheese Essentials, received a James Beard Award nomination. This lady does know her cheese! As many times as I’ve driven by Madison on I-90, back and forth from either Rockford, IL, where my sister lived for a number of years, or Chicago, I’ve never actually stopped in to check it out. I stayed at the Hilton Madison Monona Terrace, in a room with a view over Lake Monona and the famous Monona Terrace (bottom lefthand photo), designed by Frank Lloyd Wright. The hotel was a great location to take in the Wisconsin Cheese Originals Festival, directly connected to the Monona Terrace that held the festival. And just a few short blocks in the opposite direction was Capital Square and the famous Dane County Farmers’ Market, the largest producer-only farmers’ market in the U.S. All items are produced locally by the vendors behind the tables. It was here that I was introduced to bread cheese (upper righthand photo), warm and gooey and fried on a griddle. Fabulous! Of course, I just had to take part in one of the cheese tours offered during the festival. We left the hotel before 8:00 in the morning and didn’t return until 5:00 that evening. Of the three tours available, I chose “From Oldest to Newest: The Best of Wisconsin Dairy”. 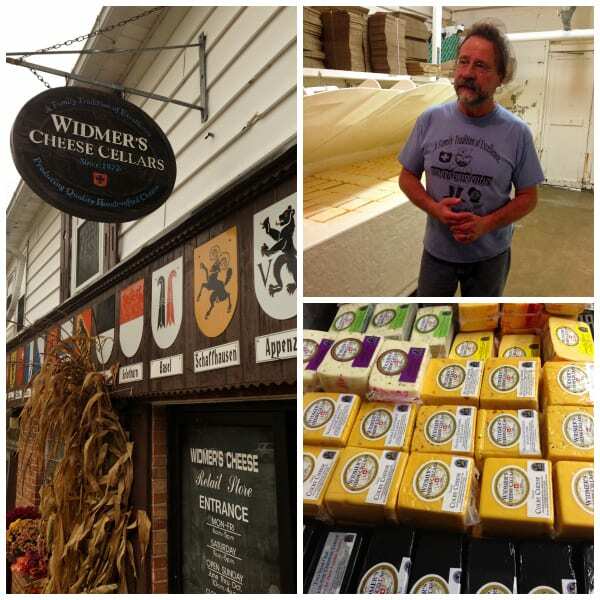 We traveled east to the tiny hamlet of Theresa, for our first stop at Widmer’s Cheese. Joe Widmer, Master Cheesemaker, met us at the door for a personal tour of his family’s cheese plant. You already know how much I value and admire family farms that have seen a multitude of generations at their head. Widmer’s has much to be proud of here. 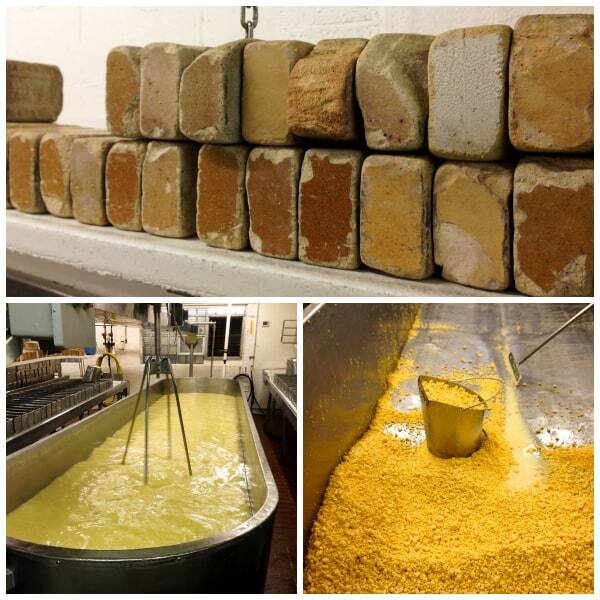 Started in 1922 by Joe’s grandfather, a Swiss immigrant, this cheese company still uses the original bricks to press its cheese curds, from when Widmer’s was first established nearly 100 years ago. Joe said it this way…“We’re still making cheese like the Flintstones!” He says it’s hard work, but worth it. to watching the cheese bricks floating in salt brine (upper lefthand photo), to feeling the dripping humidity in the curing room (upper righthand photo) – it was all a delightful education. 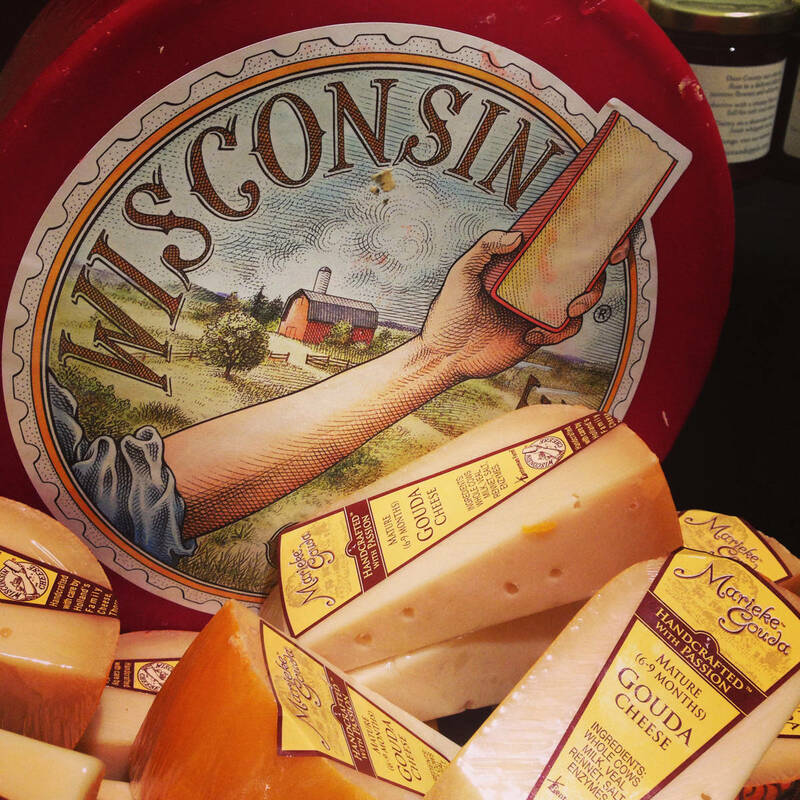 Widmer’s offers two Wisconsin originals, Wisconsin Brick and Colby cheeses, both invented in Wisconsin in the early 1870’s. They also offer cheddar cheeses, from mild to extremely sharp. All of their Brick, Cheddar, and Colby cheeses have won Blue Ribbons in various U.S. and world competitions. The little open-faced sandwich in the lower righthand photo? Well, that’s where the recipe for the Wisconsin Macaroni and Cheese in this post comes from. The sandwich is an old German tradition, consisting of a slice of rye bread, brick cheese, raw red onion, and mustard. I liked the milder brick cheese when I tried it on this sandwich, but it was a bit too much for me after I brought some home and let it age for a few months. It gets very pungent with aging! Widmer’s aged cheddar, on the other hand, was downright lovely to my taste buds. I’ve eaten aged cheddar before, but never in side-by-side comparisons with a variety of agings from the same cheese maker. Widmer’s did just that for our group (middle photo), and it was incredible to experience the differences in tastes and textures in each of the two, four, six, and eight year agings. Widmer’s 8-year cheddar was delicious and creamy, without some of the bitterness I’ve associated aged cheddars with. Fun fact from Joe: Did you know that all cheese is white, until colored by annatto, a natural food colorant? And why oh why have I never been introduced to cold pack cheese (lefthand photo) before?! That little tub of Widmer’s brick cold pack was AMAZING. Also…have you ever tasted super fresh cheese curds (righthand photo), fresh from the vat? I can’t even describe. Needless to say, the cooler that the festival provided to tour participants came in very, very handy. Could you hear me on the bus? That was me, the happy girl, munching on her squeaky fresh cheese curds! At the next stop near Chilton, at LaClare Farms, the goat is king. 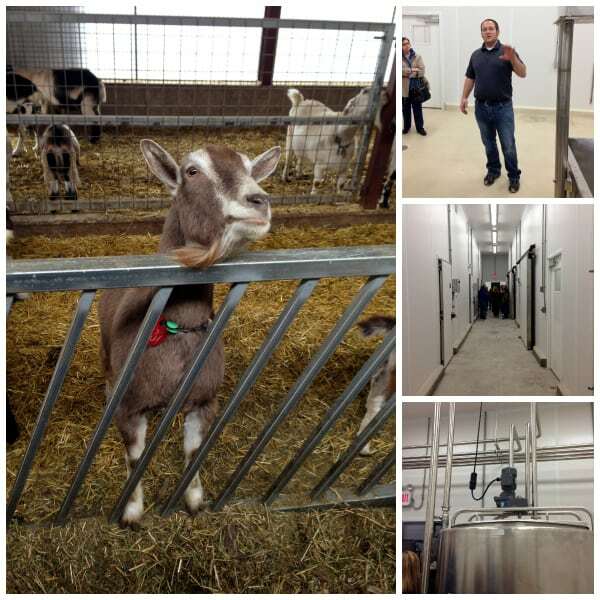 Milking 450 goats two times per day, the Hedrichs family has just finished building a new farmstead goat dairy and cheese factory, all bright and white and shiny. After being members of a cheese making co-op for many years, the Hedrichs were going to start making their cheeses in their very own facility the week after I toured there. Exciting! Started by Larry and Clara Hedrichs in 1978, LaClare Farms is a family business through and through. Their son Greg (upper righthand photo) is the business manager and gave us a tour of their facility. Their daughter Katie, award winning cheese maker, was on her honeymoon. And daughters Jessica and Anna are also involved in the business, in the retail store and cafe, and herd management, respectively. And all their cheeses are named after family members! It was interesting to see the striking differences in facilities from Widmer’s to LaClare’s, old to new. At LaClare Farms, each cooler room is set to the optimal temperature for each cheese that they make. 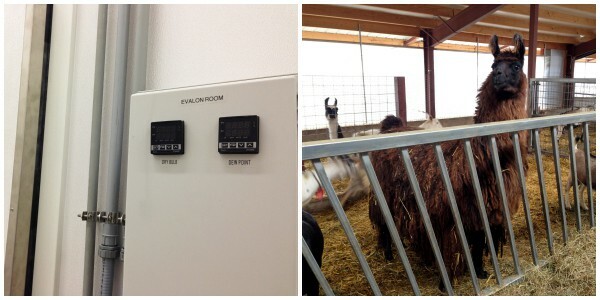 The Evalon Room (lefthand photo), housing my very favorite cheese from LaClare Farms, can hold 3,000 wheels of cheese! And why the llama, you ask? The Hedrichs family employs the protective manners of two llamas, who act as guards for the goats. The Hedrichs family creates all kinds of goodness from their farm. The Evalon cheese is a Gouda-style artisan cheese, with a hint of Asiago flavor and texture. It grates extremely well, but I never make it that far. It is now one of my favorite pre-meal nibbling cheeses, and needs nothing more than a glass of wine to accompany it. LaClare Farms also has a few flavor-enhanced Evalons, plus cheddars, chevre, blue, and Fondy Jack. We were treated to a variety of these in the LaClare Farms cafe, where we ate lunch. Finished off with a goat milk caramel…perfection! 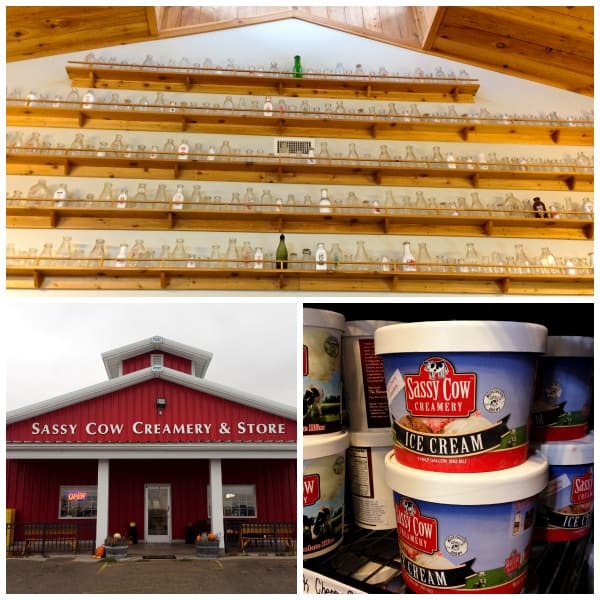 Our final stop on the tour was at Sassy Cow Creamery & Store near Columbus. Here the Baerwolf Brothers bottle milk and make ice cream from the milk of their family herds. They produce mostly fluid milk, selling their brand right there from the store, and beyond. They are all about staying within their smaller niche, not wanting to compete with larger dairy brands, to drive home the fact that they are a Wisconsin dairy farm with cows. Sassy Cow’s cheese maker creates only fresh cheeses for their store to sell, nothing aged. I was given a tip by our tour leader to try the Sassy Cow string cheese, so I grabbed a bag for my cooler. When I got home, I tried it as I shared it with our girls. And, wow. Our tour leader wasn’t kidding. That string cheese was like none I’ve ever tasted before. It was fresh and ultra tasty and fabulous! I’m nostalgic, you know that. So I totally loved all the old milk bottles (upper photo) lined up around Sassy Cow’s upper walls. And who can resist ice cream? Sassy Cow makes their own, and you can even grab a hand-dipped cone on your way out the door. Which I surely did. Can you say, “salted caramel, please”? It was wonderful! And so here we are, at the end of my Wisconsin Cheese Originals Festival tour. 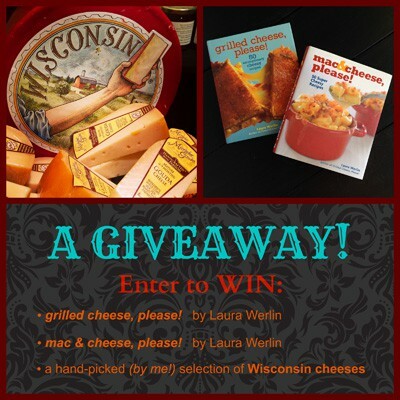 And I have one awesome giveaway for you, courtesy of Wisconsin Cheese and Laura Werlin. You could win two of Laura Werlin’s books, full of all kinds of cheese-filled inspiration, PLUS a hand-picked selection of some of my favorite cheeses from my visit to the Wisconsin Cheese Originals Festival. I promise you…you WANT to win this! 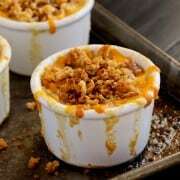 And read on for the recipe for Wisconsin Macaroni and Cheese. It is SO GOOD. I didn’t know what I’d think of the rye bread crumbs or the spicy brown mustard, but they added so much flavor and depth. Make it. You won’t regret it. My whole family promises you that! Preheat oven to 375°. Butter eight 8-ounce ramekins and set aside. Fill a 4 to 5 quart pot about three-quarters full with water and add 1 tablespoon of the salt. Bring to a boil and add the pasta. Cook, stirring once or twice, until tender but firm, about 4 minutes, and drain. Reserve the pot. Put bread slices in a food processor and process until the crumbs are coarse. Set aside. In a medium nonstick skillet, heat 2 tablespoons of the butter over medium-high heat. Add bread crumbs and cook, stirring frequently, until toasted, about 3 to 4 minutes. Transfer to a plate. Wipe out the skillet. Using the same skillet, heat 1 tablespoon of the butter over medium-high heat. Add chopped onion and cook, stirring occasionally, until soft and translucent, about 5 minutes. Add sausage and cook, stirring occasionally, until lightly browned and heated through, 8 to 10 minutes. Add black pepper to taste. Transfer to a paper towel-lined plate to drain. Set aside. Using the same pot you used to cook the pasta, melt the remaining 2 tablespoons of butter over medium heat. Slowly whisk in the flour and stir constantly until a paste forms, 3o to 45 seconds. Continue stirring for 1 to 2 minutes more, until the mixture starts to darken slightly and smell a bit nutty. Slowly whisk in the milk, cream, and the remaining 1 teaspoon of salt. Cook until the mixture starts to thicken and is just beginning to bubble around the edges, 7 to 9 minutes. It should be thick enough to coat the back of a wooden spoon. Add 2 cups of the Colby and all of the Fontina, and cook until the cheeses have melted and the sauce is smooth but not too runny. If it’s soupy, just continue cooking until it thickens. Then add the pasta, onion, brats, mustard, and cayenne. Stir just until incorporated. Divide evenly between the prepared ramekins. Sprinkle with the remaining 1 cup of Colby and top with the bread crumbs. 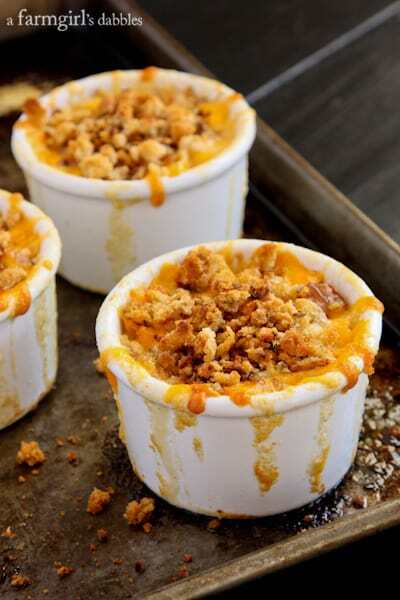 Place the ramekins on a rimmed baking pan and bake for about 25 minutes, or until the mixture is brown and bubbly. Let cool for 10 to 15 minutes before serving. Adapted just a bit from mac & cheese, please! by Laura Werlin. Disclosure: A great big thank you to the Wisconsin Milk Marketing Board and Wisconsin Cheese for providing me with the awesome experience of the Wisconsin Cheese Originals Festival. I was not compensated to write this post. All opinions are my own!